Shipping, in contexts, is a couple but it’s also not an official couple. It’s only “official” when the characters confess and confirm they are indeed a couple. Any time before then, it would be considered a shipping couple. When looking around the net for these ship couples, you see these bizarre names. MakoHaru? Pokeshipping? Kataang? These are shipping names. Shipping names are a fun way to see various shipping couples in the fandom. Sometimes, it’s the best way to organize shipping from a fandom. Some will make sense while others seem completely out of nowhere. But if people ship it, then it exists. But if one person ships a couple, it doesn’t automatically get a well-know or recognizable shipping name. Now with each shipping name, sometimes it’s simple like putting two names together like MakoHaru from Free. That pairing means Makoto and Haruka, and if you look up anything under MakoHaru you’ll see a lot of fanart of the couple, fanfics, and episode gifs of the declared “MakoHaru moment”. Then you get shipping names that aren’t so obvious like Pokeshipping. 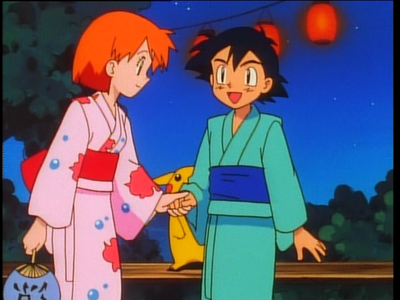 Pokeshipping is the name for the Ash and Misty pairing. The name comes from the first season of the Pokemon anime. If you go into further shipping, you’ll see something like Contestshipping which is May and Drew from Pokemon Advance and since they partake in Pokemon contests, that is where the source of the shipping name comes from. Shipping names can be fun and can also be confusing. When getting involved in a fandom, coming across shipping names is something that will come up a lot. Looking at the couples someone might ship in that fandom; it’d be nice to know what they are called by everyone else who is involved in the fandom.